Saint Remy de Provence is perhaps the most sophisticated village in Provence but still remains a small rural, authentic Provencal town. There are wonderful Provencal fetes and celebrations held throughout the year to commemorate Saints days or important agricultural events. Local fetes are a community tradition honoured for centuries; little has changed today. There are also wonderful boutiques for shopping, contemporary hotels and Michelin starred restaurants to enjoy. Les Alpilles National Park lies 20 minutes South of Avignon, and 45 minutes to the North of Marseille. 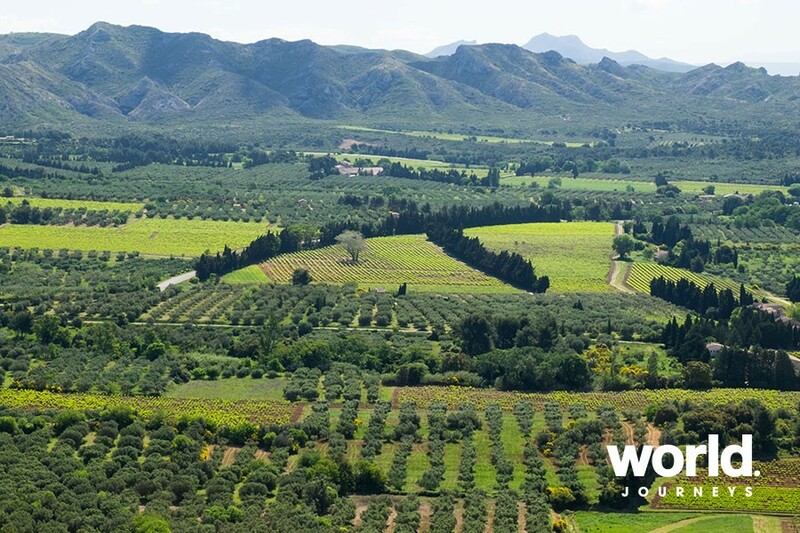 It is characterised by a small range of jagged limestone foothills, valleys filled with olive trees and vineyards. Roaming goats and sheep are tended by shepherds just as they were in centuries past, grazing on wild rosemary and thyme which perfume the delicious regional cheeses. 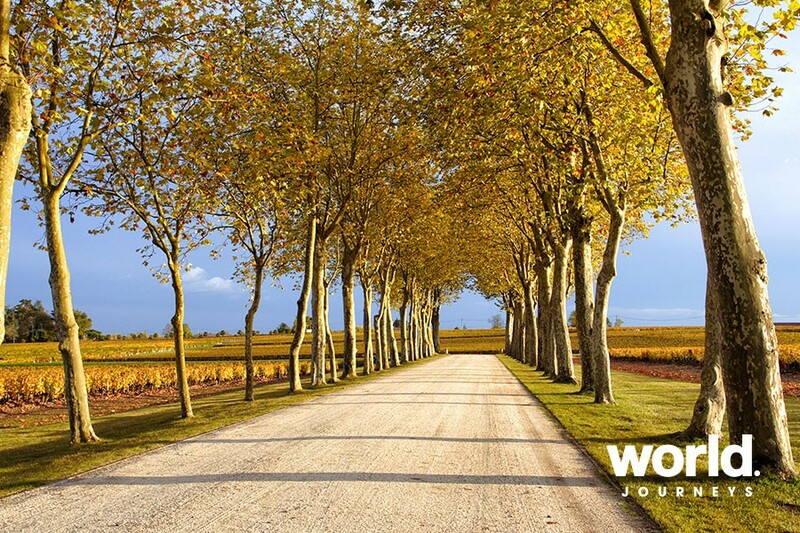 Far removed from the bustling Cote d'Azur; this is scenic countryside punctuated by quaint villages. Day 1: Avignon > St Rémy de Provence Meet your guide at Avignon TGV train station and private transfer to your 5 star hotel Chateau des Alpilles, in the countryside around St. Remy. Enjoy dinner at the gourmet restaurant of the relais. Day 2: Luberon, colorful villages & Lavender Museum Meet your private guide at the hotel for a full day excursion by private car: we will visit the Luberon, one of the most picturesque areas of Provence, the village of Gordes and the other perched hill top villages of Roussillon, the mysterious Lacoste dominated by the Marquis de Sade castle, Bonnieux and Menerbes. Gordes is a beautiful perched medieval village and has a delightful medium sized market every Tuesday of the week with wonderful hand-crafted, homemade and locally grown products. Your guide will introduce you to the vendors and their products, and will provide tastings, recipes and history along the way. Then you will visit the other Luberon villages such as Roussillon, Provence's most colorful village in the middle of ochre cliffs. We will stop at the Lavender Museum in Coustellet to learn about the making of the essential oils, lavender cosmetics, and soaps. Transfer back to St Remy and overnight at Chateau des Alpilles. Day 3: Saint Rémy de Provence, Les Baux, Maussanne, Eygalieres & Olive Oil tasting Meet your private guide at the hotel for a full day excursion by private car: we will visit Saint Rémy de Provence, the town where Van Gogh spent many years, the extraordinary light and colors of this village inspired Van Gogh's masterpieces (he created there over 150 works, including Starry Night), then we will visit the surrounding Alpilles villages of Les Baux de Provence, Maussane and Eygalieres. St Remy hosts every Wednesday a vibrant and bustling market with wonderful products, and people coming in from all over the world just as they have been for centuries. Then we will drive to Le Baux where we will visit in an olive oil mill for a products tasting session (tapenade, olive oil, etc.) while discovering the olive oil making process. Transfer back to Chateau des Alpilles . 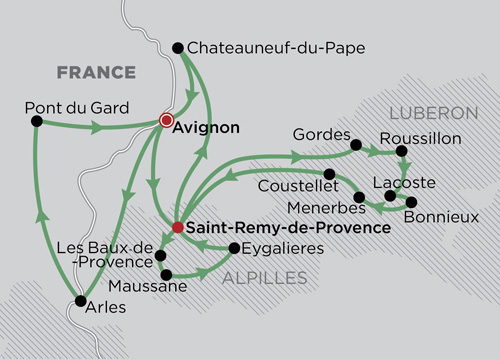 Day 4: Avignon & Chateauneuf du Pape Meet your private guide at the hotel for a full day of touring to Avignon and Southern Rhone wine country. 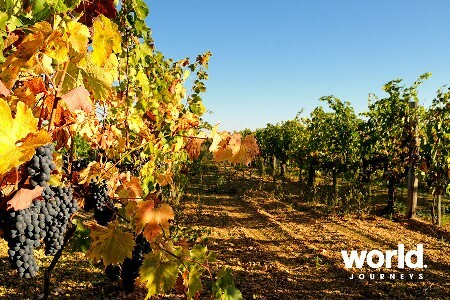 We will travel to Chateauneuf-du-Pape - one of the country's premier wine-growing regions "“ where we will visit a superb wine cellar, the Chateau de la Nerthe, and after a visit of the wine cellar we will taste a selection of the wines that are produced there. After our tasting, we will have lunch at La Mere Germaine, a restaurant in Chateauneuf-du-Pape which is a favourite with winemakers, artists and celebrities visiting the area. Then we will travel to Avignon and check into the 5 star Hotel de l'Europe, before our guided visit of Avignon in the afternoon. Surrounded by imposing city walls, Avignon is well known as the residence of the Pope in the 14th century. 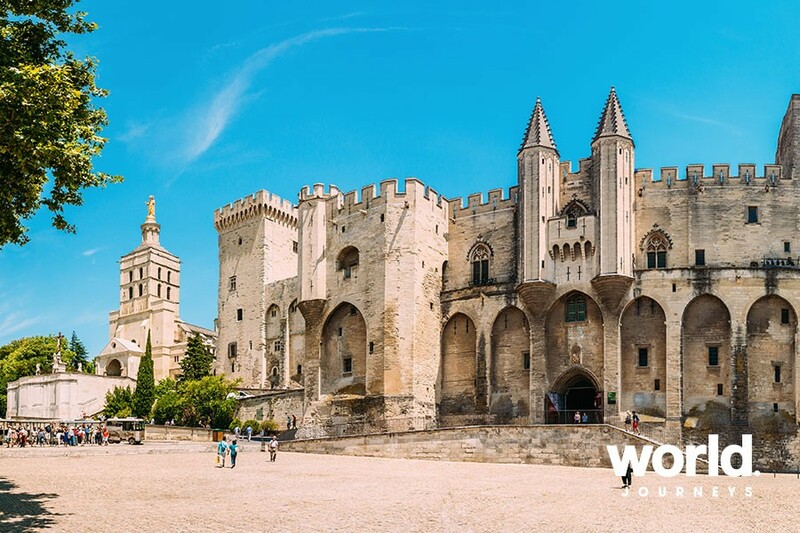 Your guided tour of Avignon will also take you to visit the awesome Palace of the Popes to see the enormous banquet rooms, original frescoes, floor tiles and other details of its interior. The Palace paints a vivid portrait of the Pope's life in that era. Overnight in Avignon. 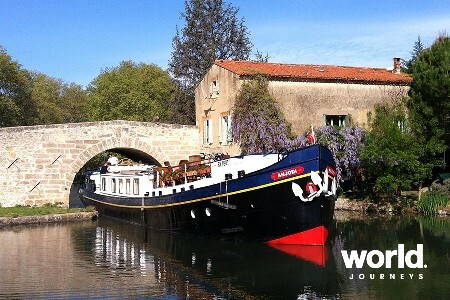 Day 5: Arles & Pont du Gard Meet your private guide at the hotel for a full day excursion by private car to Arles and Pont du Gard. 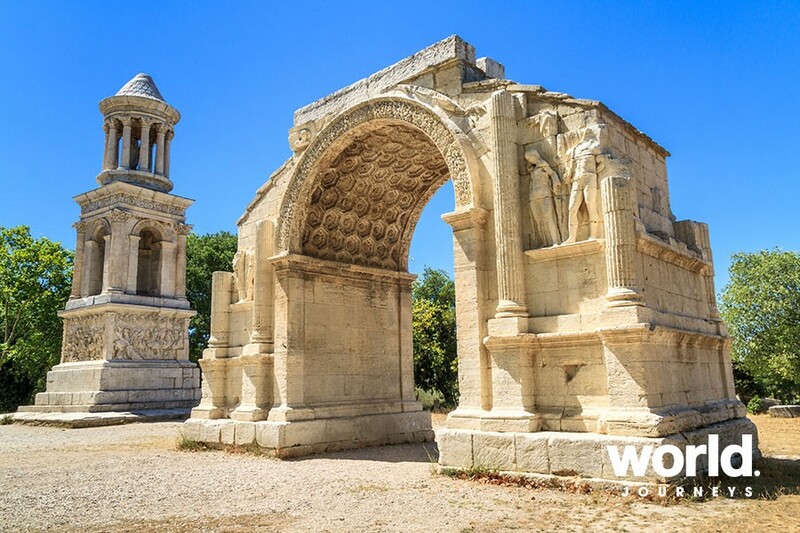 Arles, an over 2000 year old city and UNESCO World Heritage Site, is a real open-air museum and will surprise you with exceptionally well-preserved ancient architectural masterpieces. 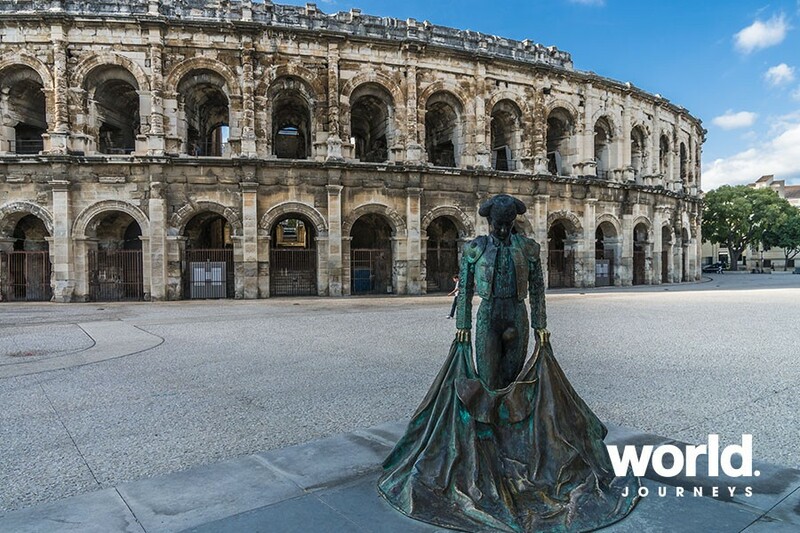 Arles is the icon of France's "Midi" (Southern France), a lively city full of ancient, fascinating traditions: its special language, costumes and traditional festivals make Arles a capital of Provencal culture. These colorful, vivid, festive and friendly traditions are the best way of discovering the history and identity of this region. During the guided visit, you will see the Roman Amphitheatre, the Theatre Antique and St Trophime Square with its cloisters and church that were part of the Arles Route, one of the three routes leading to Santiago de Compostela. We continue the visit to Forum Square and finally the Roman Baths of Constantine. Enjoy time at leisure to stroll through the historic centre - your guide will tell you about the many Arlesiennes traditions: the bullfight and the wonderful traditional Arlesian dress and its history that inspired the fashion-designer Christian Lacroix. Pont du Gard is a fairy- tale medieval village, perhaps the most impressive Roman site in all of France. This fascinating aqueduct is a technical and artistic masterpiece, built in the 1st century by the Roman Emperor Agustus, it is listed as a UNESCO World Heritage Site. 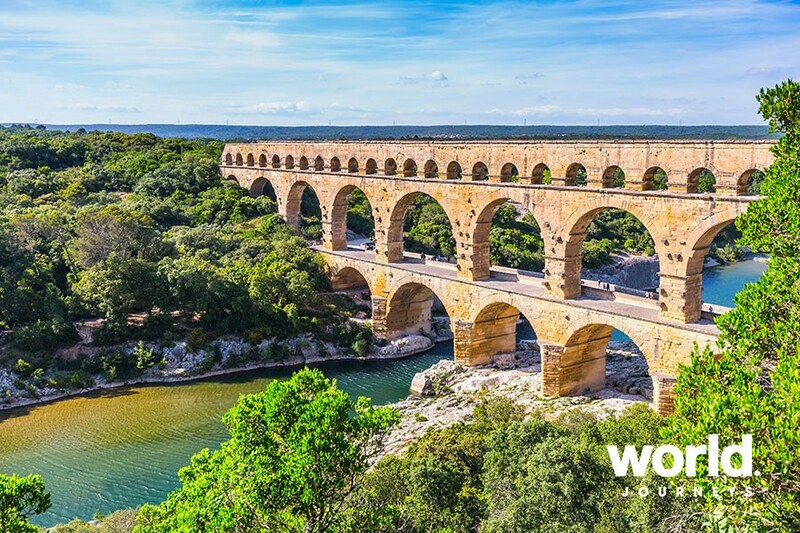 The Pont du Gard has been beautifully preserved and is surrounded by 407 hectares of protected National Park land, with the river Gardon flowing below its arches. Optional - private, hands-on cooking lessons can be organized at a renown restaurant in Avignon. Ask us about extending to the French Riviera. Independent tour departs daily subject to availability. To take advantage of the markets mentioned, the ideal start day for this tour is a Monday. • City taxes variable to be paid locally. • Train tickets. 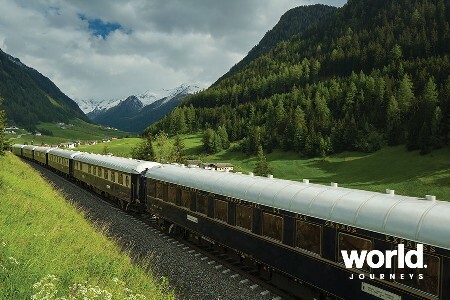 • Meals other than those mentioned, • Drinks other than specified in wine tastings • Gratuities for driver guide. 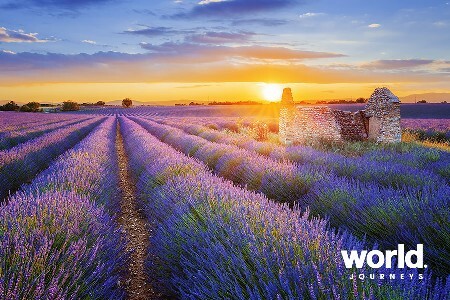 Authentic Provence 6 Days / 5 Nights Visit the Provence of Van Gogh; with wild Iris, sunflower and lavender fields, olive oil and local honey.